Lira is the daughter of the Sea Queen, and as such must hold herself to a certain standard to be worthy of inheriting the crown. To ensure she is deemed worthy her mother has ensured all sympathy and empathy is beaten out Lira, and ensured that she is brought up with the cruelty and lust required to rip the hearts out of her chosen victims. Lira’s victims of choice happen to be human princes – which has earnt her the fear she desires, along with the name of Prince’s Bane. Elian of course a prince, but more so, he is an adventurer. He is a reluctant prince and his responsibilities feel more like a suffocating burden than a gift. He much prefers to spend his life on the seas, wandering the world, and of course, hunting and killing sirens. However, he is a dreamer with a purpose – his journeys and dreams have lead him to a fairy-tale which may hold the key to finding a way to free the seas of sirens – and of course the Prince’s Bane and Sea Queen – forever. These two characters find themselves thrown together after Lira disobeys her mother, who punishes her by making her human, and Elian is the ship that happens to rescue her. The Prince’s Bane and her prey, finally together at last – however Lira has lost her song and Elian does not know Lira in her human form. The two form an unlikely, and tense, alliance when Lira promises to help Elian find the key to destroying sirens – with her own plan of using it to her advantage of course. I really enjoyed the relationships in this story, the existing and establishing ones. There were some great previously established friendships/relationships that shine through in this story, without getting a massive backstory dump to show you the depth of the relationships. And the new relationships that develop in this story are natural – some are too trusting and quick, others are very untrusting and tense – the way which the relationships are built fit with the characters, even the secondary ones. Elian’s crew are fabulous as individual characters – I loved their bond and their banter! callously ripped out the beating hearts of unsuspecting princes because that is what was expected of her – she started to comprehend that she had the choice on if her hands are stained in blood. So you may be thinking this is kind of a retelling of The Little Mermaid – well, kind of. However, this is no Disney retelling – this is dark and gruesome, untrusting and seductive. The world-building was fantastic, with vivid imagery and details. I found myself swept away with this story due to the lush and monstrous descriptions. There are secrets and betrayals, unpredictable twists and turns, and more than one heart will be ripped out. 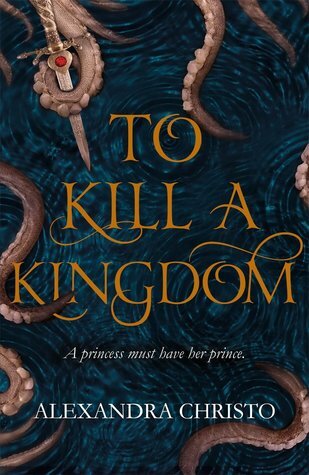 To Kill a Kingdom is filled with brutality and kindness, deception and magic, betrayal and spirit. This little mermaid wants the pirate prince’s heart in her hands – literally.